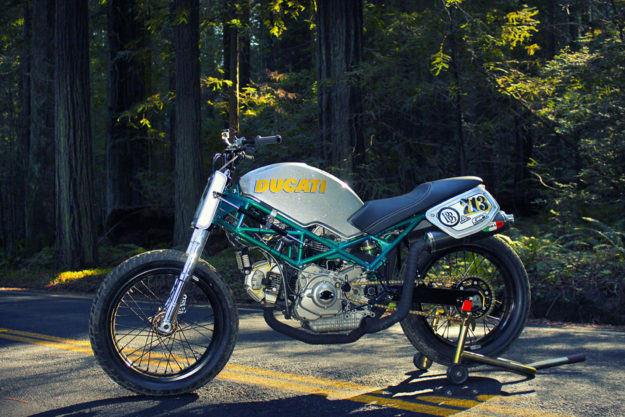 A Ducati Monster tracker ready for the Superhooligans, a monstrous Indian Chief-powered cafe from Germany, a gorgeous Honda built for Steve Caballero by Denton Moto, and a heavily patina’d Honda CB450 from … Nepal. 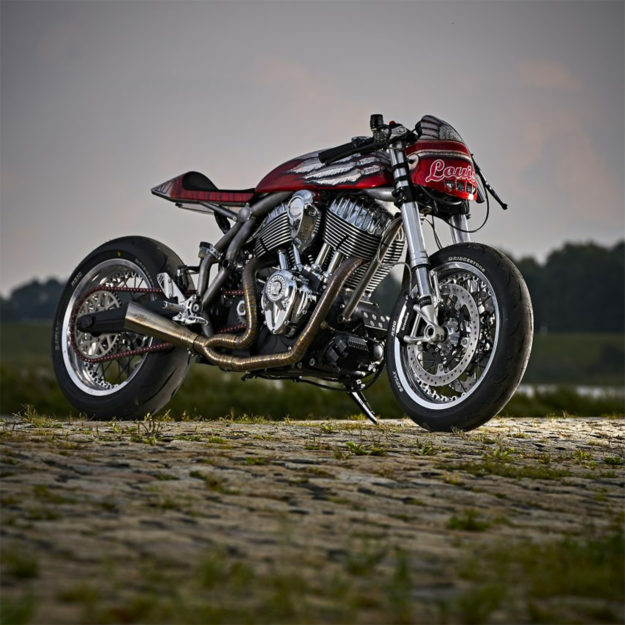 Indian Chief by Detlev Louis Motorrad Indian has its engine game on lock down: everyone loves the performance of the 100-horsepower beast in the Scout, and the looks of the gorgeously finned Thunder Stroke 111. 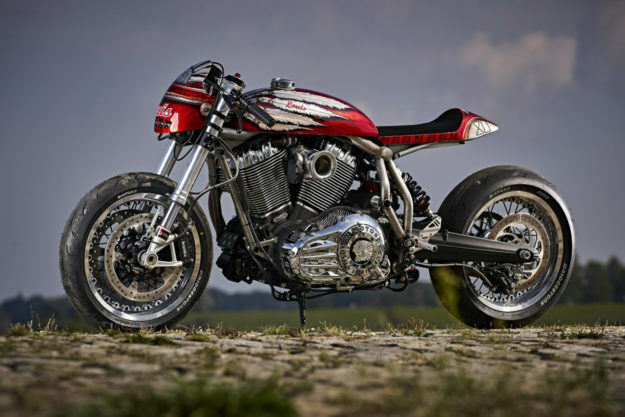 To further bolster that point, the huge European parts dealer Detlev Louis Motorrad has taken an Indian Chief and built a bruiser of a cafe racer dubbed Engina. 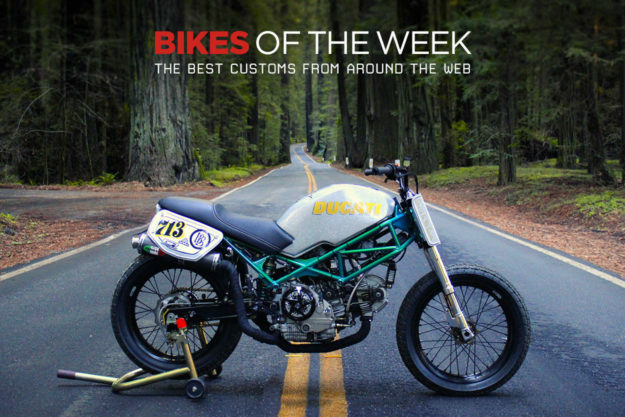 It’s more than just a pretty bike. Out of the box, the Thunder Stroke delivers 119 ft-lbs of torque, which is plenty impressive. But after a new set of cams were swapped in, airflow was redirected, the heads were re-touched and the ECU was flashed, engine specialist Ulf Penner dug up an incredible 70% increase. Engina now develops about 125 horses and could probably shred the Earth’s mantle with an angry right wrist. 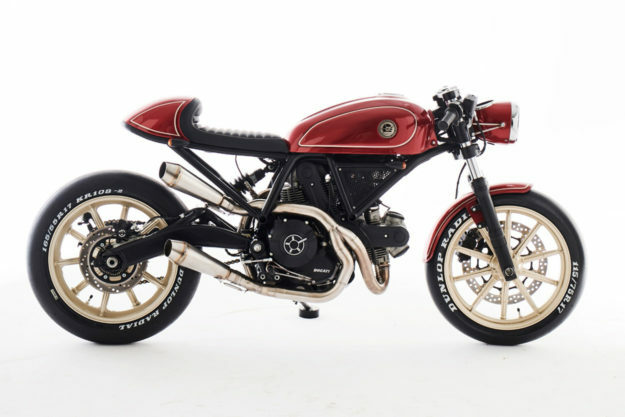 Ducati Monster tracker by Behind Bars Customs Just over a week ago, Ducati announced their partnership with Lloyd Brothers Racing to run a Monster-based racer in the American Flat Track Grand National Series. 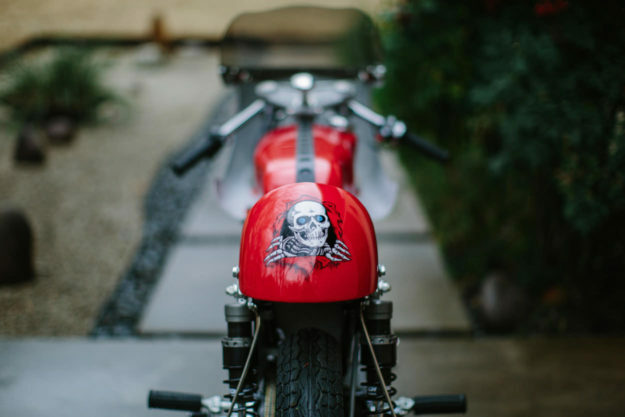 And while the 821-powered bike being piloted by Steve Bonsey looks the business, so does this tracker from San Diego based Behind Bars Customs—which tips a hat to Paul Smart. Built using a 1995 Monster 900 as its base, the plan was to have a streetable machine that would split lanes and loft the front end on a whim. Of course, also being able to handle its own amongst the Superhooligans at the dirt oval sounded like a good idea too. So it’s more than just lipstick and mascara going on here. Steve Caballero’s Honda CL175 racer Just over a year ago, I was at Willow Springs for a track day with some Californian friends. And while I was prepping a loaned XSR900 for tech inspection, I saw a childhood hero unloading a 1944 flathead, with a jockey shift no less. Steve Caballero’s love of motorcycles has been well documented, but I was still blown away by how he muscled that old Harley around Big Willow. 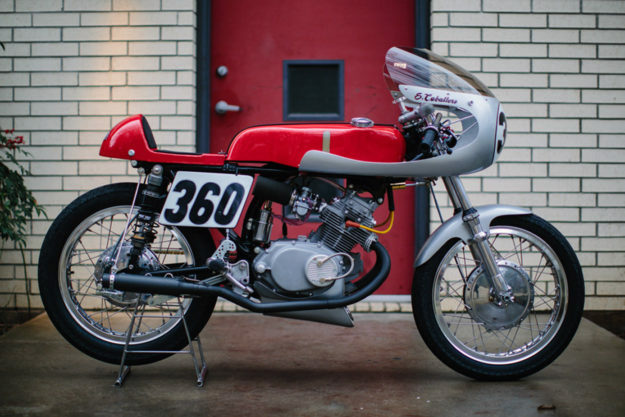 Steve probably wanted something a little more lithe for the upcoming AHRMA season, so he’s partnered with Texas-based Denton Moto to create this Honda CL175 called Cabracer360. But unlike most customers commissioning a build—especially celebs located out of state—Steve was involved in every aspect of the project. The 1969 CL175 donor was completely stripped and the engine was fully rebuilt, complete with an overbore to a more boisterous 209cc. New Keihin carbs were fitted to a set of shorter intakes, and a race-derived Cappellini oil pump was installed. On the handling end of things, the suspension at both ends has been modernized, and new clip-ons and rearsets deliver a proper racer’s tuck. And that tuck is shielded by an exquisite piece of fiberglass, courtesy of Glass From The Past. 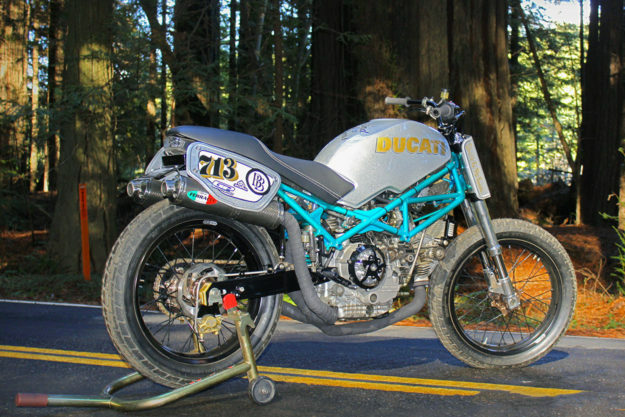 Scrambler Ducati by Eastern Spirit Garage The votes are in for this years Scrambler Ducati Custom Rumble contest. 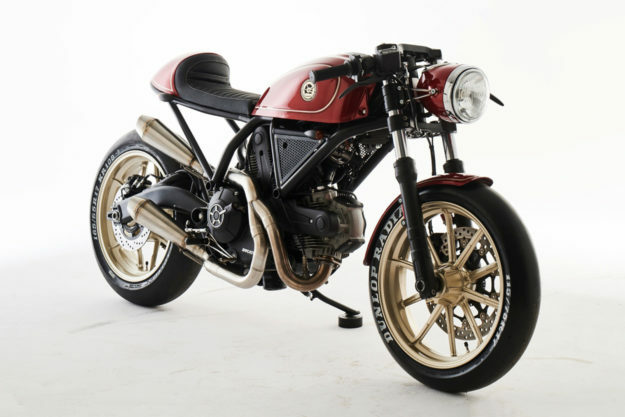 The winners won’t be announced until World Ducati Week in July, but we have a feeling that this cafe’d version from Eastern Spirit Garage and Ducati Poland will take home top honors in the dealer category. Credit the extensive use of negative space for making our mouths water around here. The relocation of the oil cooler and subsequent deletion of its bulky, plastic guards delivers a long-necked look that immediately draws the eye. ESG’s head wrench Sylwester Matusiak then created an excellent balance point by cleaning up the rear triangle, which helps showcase the Duc’s L-Twin and that gorgeous work on the exhaust. 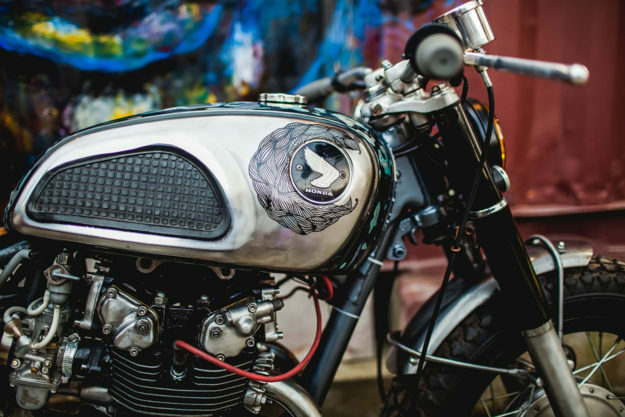 Honda CB450 by RS Moto Nepal surely isn’t one of the first places that comes to mind when speaking about custom motorcycles. 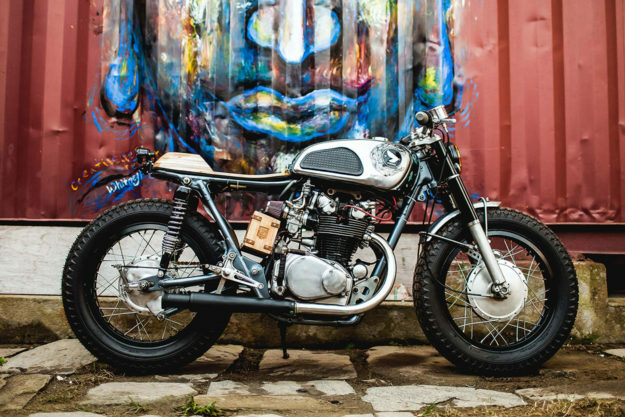 Raajib Sayami, the man behind Kathmandu’s RS Moto, aims to change that—and with builds like this CB450, he’s well on his way. 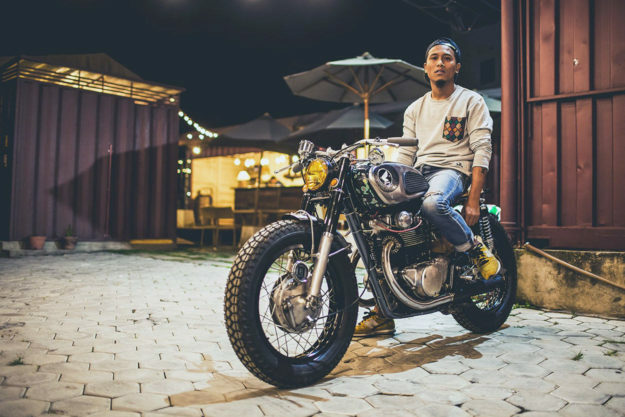 Although he has his work cut out for him—Nepalese laws prohibit modifying motorcycles—Raajib decided to throw caution to the wind and fire up the grinder anyway. The rear subframe has indeed been chopped and a new hoop welded up. It’s topped by that oh-so-controversial material, wood, for the seat. But the wood for this saddle actually has er, roots, as a religious artifact in Nepal. That gorgeous, dark top sheet was given shape by adding Canadian maple ply, so a little sacrilege certainly won’t hurt the cool factor.